Use these Loretta Lynn lyrics with chords to help you learn a few of her songs. 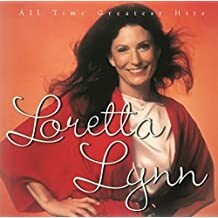 If you enjoy real country music, you gotta love Loretta, many of the songs she wrote was based on true life experiences. She married at an early age and began writing songs when she was just a teenager. What a career for this lady and she’s still performing. When Loretta sings a song, there’s never a question of whether it’s going to be country or not. For us country music lovers, we’ll be picking and singing her songs for many years to come, for old guys like me, I just want the younger generation to at least have a chance to hear a few of her songs as well as many other older country artists. If you have a g uitar, get it out and play it, if not consider ordering one and learning a few chords and enjoy your music even more.